Having a tool like 3D Counterstrain can help make the assimilation of this information easier, faster and more effective. 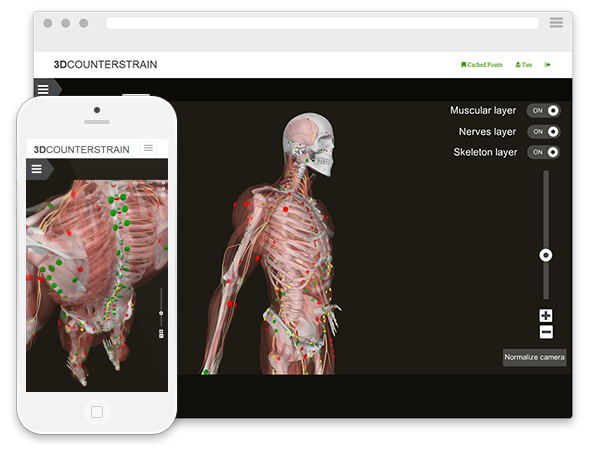 Add the ability to compare locations of all systems simultaneously and this revolutionary tool helps remove one of the biggest areas of doubt and the source of many questions among Fascial Counterstrainers. Finally, all of Fascial Counterstrain in one easy to access place. So simple, elegant and portable that it will fit in your pocket! The 3D Counterstrain application is based on systems which are purchased individually. Registration requires a few steps including practitioner license verification and FCS course completion verification. See General Requirements below for more details. Visceral: The visceral course, dating back to 2008, is where Fascial Counterstrain really began its recent expansion process. This is the course that eventually led to the development of each successive system, and its the course that brought Fascial Counterstrain back to life. It includes all of the tenderpoints from the 3-day seminar, and some new discoveries that have been recently added to the list. All told, more than 70 tenderpoint locations are illustrated on the model and displayed in the color pink to help differentiate this system from the 4 other general course categories. You get access to the 3D model showing the precise location and of course how the location relates to all other points in the system. As you add additional systems to your account throughout your training, you can layer each system upon the next for a truly phenomenal picture of the true state of Fascial Counterstrain. Screenshot from the Visceral Course. Lymphatic/Venous: This is perhaps the most changed of the 3-day courses. 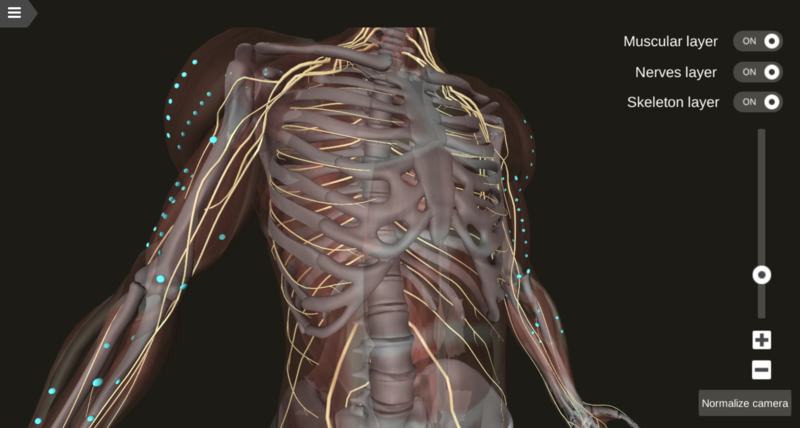 Since it first emerged in 2008, the Lymphatic Venous course has seen numerous additions. So much so, that the current version had to go through a significant truncating process to remove any technique that was deemed not as powerful as the others. Not that the techniques were somehow non-effective, just that in order to maintain a 3-day course offering for the LV system, techniques had to be removed from the curriculum. There are well over 100 locations in this system and the model helps to define both the layer of palpation and relation to nearby, often overlapping tenderpoint locations. Screenshot from the Lymphatic & Venous Course. Arterial: Arterial treatment came out in February of 2012, after more than 2.5 years of development work. It was a great start, but wow, what a difference 4 years makes! If you haven’t been to an arterial course of late, this course has seen some impressive changes. The model is no different. All currently taught techniques are represented in red and there are a lot of them! Equalling the level of complexity of the Lymphatic course, but not quite that of neural gives the arterial course about 100+ individual techniques. Screenshot from the Arterial Course. Neural Part 1 and Part 2: This is likely the most exciting course to date. Given the broad range of applicability and the treatment power available to well trained Fascial Counterstrainers of the nervous system, it’s no wonder the 3-day classes fill up months in advance. This is also the most complex of all systems and knowing the related anatomy is paramount. We have referred to modern day Fascial Counterstrain as a form of applied anatomy, and the nervous system is a perfect example, in fact it is the physical embodiment of that statement. This system is so vast and all encompassing in terms of treatment applicability and power that it became necessary to separate the material into two separate courses. N1 and N2 literally cover the body from head to toe with tenderpoints and treatments and present collectively some 160+ individual treatments. 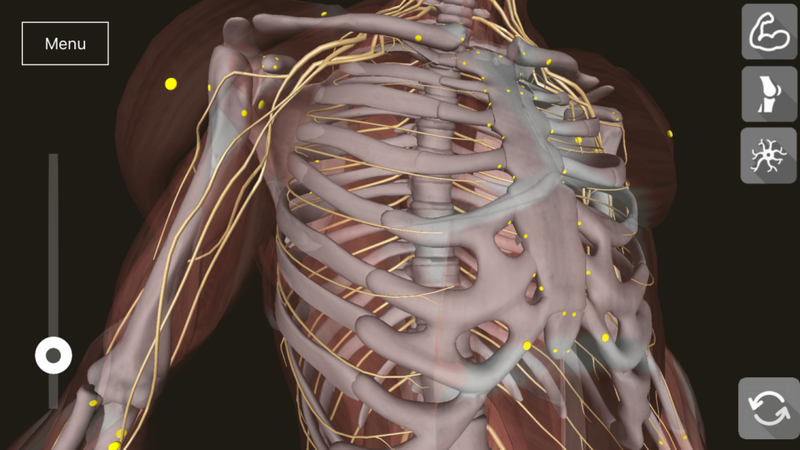 You will be hard pressed to find a more comprehensive approach to the treatment of nerve dysfunction than the Fascial Counterstrain approach. Screenshot from the Neural Course (Part 1). Musculoskeletal Part 1 and Part 2: Description coming soon. Introduction to Fascial Counterstrain: For those of you that have joined the Fascial Counterstrain community recently, we have a special version of the model specifically to go with the Fascial Intro course. It includes all of the tender points from each of the 5 main systems addressed with Fascial Counterstrain. It is the perfect companion to your syllabus and a great way to begin your journey to becoming an expert practitioner of Fascial Counterstrain. 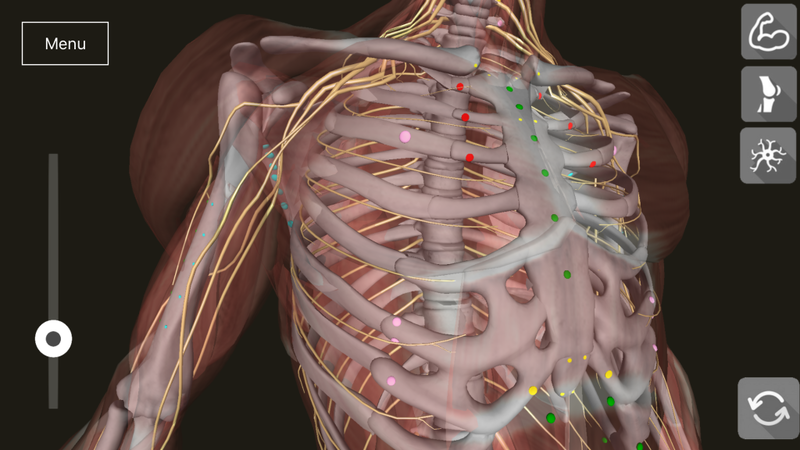 Screenshot from the Fascial Intro Course. Fascial Intro: 2015. First taught in March 2015. Visceral: 2013. First taught in Nov 2008. Lymphatic/Venous: 2013. First taught in Nov 2008. Nerve 1: 2014. First taught in Feb 2014. Nerve 2: 2016. First taught in March 2016. Currently all fees associated with accessing the model apply to individuals only and will provide access to one computer and one iOS device or one Android device at a time. As of January 25, 2019, the fee for each course is $99 (Partial refunds for previously purchased courses are not available.) The $99.00 USD fee is per course and is a one time fee associated with purchasing a license for that course. One year after the purchase of your first course, you will be charged a $99 recurring annual maintenance fee. This $99 fee covers your access to the 3D model if you have one or all courses. Updates to course material, should they occur, are included in this fee as long as your account remains current.